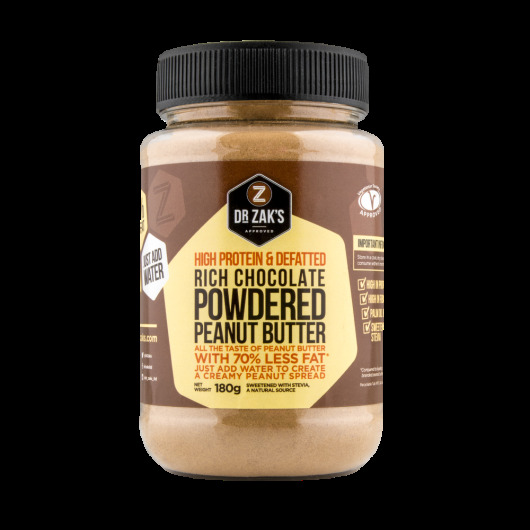 Peanut Butter just got a lean makeover thanks to Dr. Zak's brand NEW Powdered Peanut Butter! Hold up… “powdered” peanut butter? Yep - The clever bods at Dr. Zak's have taken the very same premium peanuts you find in all their other peanut butters, slowly roasted then pressed them to remove most of the fat and oil. What's left is a fine powder with just 1.9g fat per serving (compared to 7.6g in their chocolate peanut butter), 0.4g of sat fat, 4.9g of muscle building protein and a macro friendly 50 calories! It’s even high in fibre with a fantastic 2.1g per serving. 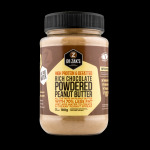 Perfect for when you want to turn a fatty peanut butter recipe into a tasty low fat treat, or if you fancy adding an extra chocolate peanut kick to your fave recipes or smoothies. If chocolate ain’t your thing, though, never fear because you can also grab this delight in Original flavour. Just 50 calories per serving! I really like powdered peanut butter and was excited about this chocolate one, but it seems to lack a bit in flavour on both the chocolate and the peanut butter. I will stick with another brand for now. Love this product. Like how you can choose your own consistency of how you want your peanut butter! Plus the chocolate flavour makes it extra tasty.